Keto: Where to begin? Easy keto recipes. A Sensible Approach to Losing Weight. Recipes that make your body better. This book is a simple guideline to help you start your ketogenic journey and enjoy a better, healthier lifestyle. The recipes are very easy and most of them take less than 20 minutes to cook. Losing weight is never a fun game as the pressure of eating healthy and limiting yourself to a certain food is always nerve wrecking. The weight loss becomes much easier if you can go back to interesting dishes that does not make your tummy upset and does not compromise your diet either. That is correct, a ketogenic diet is one such diet where you can have your cake and eat it too! 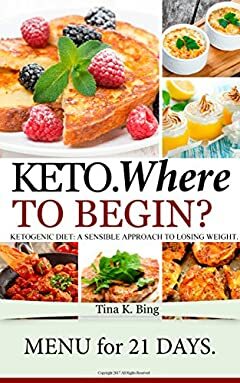 Enjoy unique Low-Carb, High-Fat Keto Diet keto-friendly recipes. Scroll up and click “Buy now with 1-Click” to download your copy now!